Fermium is one of the transuranium elements, which lie beyond uranium on the periodic table. The periodic table is a chart that shows how chemical elements are related to each other. Uranium is element number 92, so all elements with larger atomic numbers are transuranium elements. Fermium was discovered in 1952, among the products formed during the first hydrogen bomb test at Eniwetok Atoll, Marshall Islands, in the Pacific Ocean. For security reasons, this discovery was not announced until 1955. Credit for the discovery of fermium goes to a group of University of California scientists under the direction of Albert Ghiorso (1915- ). The element was named for Italian physicist Enrico Fermi (1901-54). Fermi made many important scientific discoveries in his life, and was a leader of the U.S. effort to build the world's first fission (atomic) bomb during World War II. Too little fermium has been prepared to allow scientists to determine its physical and chemical properties. Fermium is not extracted from the Earth's crust. F ermium was named after Italian-born physicist Enrico Fermi (1901-54). Fermi taught physics and did research at the University of Rome from 1926 to 1938. During this period, he learned how to use neutrons to change elements from one form (isotope) to another. He received the Nobel Prize in physics in 1938 for these discoveries. The year he received the Nobel Prize was a difficult time in Europe. Benito Mussolini (1883-1945) had just come to power in Italy. Mussolini followed many of the same unjust policies as did Adolf Hitler (1889-1945) in Germany. One of these policies was anti-Semitism (hostility toward Jews). Fermi, whose wife was Jewish, began to worry about what might happen if they stayed in Italy. Like many other scientists in Europe, he finally decided to come to the United States, where he took a job at Columbia University in New York. Soon after his arrival in the United States, Fermi's experience with neutrons proved to be very valuable. The U.S. government had undertaken a huge research program called the Manhattan Project. The purpose of the Manhattan Project was to find a way to build an atomic bomb. Fermi was placed in charge of one part of that project. Fermi's responsibility was to find a way to study the reaction that occurs when uranium atoms are bombarded by neutrons. His team did most of this research at the University of Chicago. On December 2, 1942, the team made an important breakthrough. They produced the first self-sustaining chain reaction in history. A self-sustaining chain reaction is one in which neutrons split uranium atoms apart. Large amounts of energy are produced in the reaction. Additional neutrons are also formed. These neutrons can be used to make the reaction repeat over and over again. The reaction eventually formed the basis of the first atomic bombs built three years later. After the war, Fermi returned to the University of Chicago as professor of physics. He died at the early age of 53 of stomach cancer. In his honor, the U.S. government created the Enrico Fermi Award for accomplishments in nuclear physics. All isotopes of fermium are radioactive. The most stable isotope is fermium-257. Isotopes are two or more forms of an element. Isotopes differ from each other according to their mass number. The number written to the right of the element's name is the mass number. 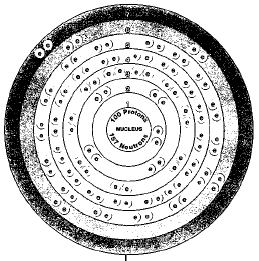 The mass number represents the number of protons plus neutrons in the nucleus of an atom of the element. The number of protons determines the element, but the number of neutrons in the atom of any one element can vary. Each variation is an isotope. The half life of fermium-257 is 20.1 hours. The half life of a radioactive element is the time it takes for half of a sample of the element to break down. A radioactive isotope is one that breaks apart and gives off some form of radiation. For example, suppose 100 grams of fermium-257 is made. Fifty grams of the isotope would be left about one day (20.1 hours) later. After another day (another 20.1 hours), only 25 grams of the isotope would remain. Fermium does not occur naturally in the Earth's crust. Fermium is sometimes used in scientific research, but it has no commercial applications. There are no commercially important compounds of fermium. Scientists know too little about fermium to be aware of its health effects. As a radioactive element, however, it does pose a threat to human health.